Jackie Peters grew up in Compton, California, the daughter of an expressive jazz musician and a talented gospel singer with a heart for the Lord. Jackie was the eldest of six children, and she was given responsibility early in her life. Jackie graciously shares with ChristianMusic.com about her family life. "I came from a family of six sisters. I am the oldest. We were raised by a single MOM, who was a gospel singer. I was the next in charge. I was very close to my Mom. She had me at age 16. She was my best friend." Jackie continues, sharing more about her father and mother. "My Dad was in jail most of my life. But, in his later years, I got to spend time with him and he enjoyed my singing. He gave his heart to the Lord, coming to hear me sing. My Dad died 6 years ago. My Mom died 7 years ago. I lost both parents less than a year apart from one another." Jackie shares with ChristianMusic.com about the talents or attitudes / character qualities she was encouraged to develop, during her growing up years. "I feel what I have was given to me by God. My positive attitude. My character, was instilled to me by my mother, but reinforced by the Holy Spirit. I always had a passion to sing to God and I always had a passion for His people. No credit belongs to me, that love in implanted in me by God. I would rather minister HIS love than to eat. That’s how the passion in within me." Jackie Peters was blessed to not only have a mom who was a strong Christian, but also had strong Christians in her extended family, which helped her grow in her faith, giving her a foundation to stand on. Several family members were involved in ministry for the Lord. ChristianMusic.com: Did you grow up in a Christian home and / or have a Christian church family or did you find the Lord later? Jackie Dyles Peters replied, "I gave my heart to the Lord at a very young age. It’s been so long ago and I was so young I don’t even remember the age. I’ve asked my Mom and she said around 3 yrs old. Both grandfathers on both sides were gospel preachers. And my uncle was a preacher." Jackie had many bumps in her road causing her pain and disappointment through her growing up years. Becoming an adult just brought more of the same, only worse! She had many opportunities to grow in her faith and in her relationship with the Lord. "As a young person, I have had a lot of disappointments and grief. As I became an adult, disappointment and grief magnified. I had no one to cry to, I turned to God for any kind of relief. He came through my time with HIM. I feel head over heels in love with the almighty and falling in love put a new song in my mouth. I remembered the pain but I didn’t feel it any more. Songs and songs began to pour out of my heart." Jackie Dyles Peters was filled with a driving desire to be fully in the Lord's will for her life, and she shares with ChristianMusic.com the process she went through in connecting to the leadings of the Holy Spirit. "One day I wanted to know the purpose God had for my life. I asked him because I was unsure that I wasn’t just spinning my wheels. I wanted to make sure I was walking or running in the direction that I should be. Because I let so many years pass through my hands due to decisions I had made in my life. I was playing “catch up” to do what I thought God wanted me to do." "I began to question if I really knew what my purpose was. Because I so desperately wanted to be in HIS will. I began to ask Him over and over what my purpose was. I didn’t ever get an answer. One day out of the clear blue. The Lord spoke to me while I was ministering to some young people (ages 4-10). He asked me to ask them what they wanted to be when they grew up. So I did. The first child I asked couldn’t have been more than 4 years old. They replied “a doctor!” I asked another, child around 7 or 8 yrs old. They replied “a teacher!” I asked another child around 9 yrs old. They replied “a police”. "Then the Holy Spirit spoke to me in a quite voice “the desire that they have, I put it there and that is the purpose I have for their lives. What they want to be in life is instilled in them from the beginning. But a lot of them won’t ever walk in their purpose. Why! Because of decisions that they will make in life. Paths that they will decide to take will lead them away from what they so much desire to do. That doesn’t mean I don’t love them or they don’t love me, that just means that their purpose that I have for them will be buried with them." "I never forgotten that. I have always loved singing since I could talk. I have always loved to minister to the Lord and others. But, things that caused me to get off my path to my purpose; Relationships, hurts and pains, feeling sorry for myself, caught up in things other than God and I went totally off until I believe that my purpose had to be something else. I have wasted a lot of years behind me." "I have told the Lord over and over again, that I am so sorry of being so caught in me and forgetting what I was created to do. PRAISE HIM and as I do that I know deliverance will come to me and to others! My purpose is to sing praises unto God and lead others in songs of praise that will bring deliverance to their lives. BORN TO BE A PRAISE LEADER!" Psalm 116:1 (Amplified) I LOVE the Lord, because He has heard [and now hears] my voice and my supplications. To the end that my tongue and my heart and everything glorious within me may sing praise to You and not be silent. O Lord my God, I will give thanks to You forever. Jackie Peters today fully uses her musical gifts in a musical ministry for the Lord. 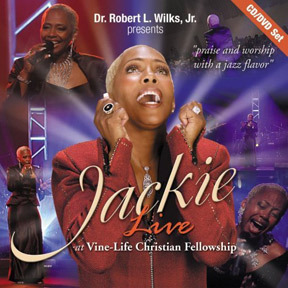 She is a gifted songwriter, Praise Leader and a powerful performer, sharing her faith through her music, which is creatively flavored with both gospel and jazz; two genres of music which her parents were gifted in performing and who passed this love and talent onto their very gifted daughter, Jackie. Jackie's powerful musical gift emerged very early in her life, and she had opportunities to use and develop her musical gifts through various experiences which presented themselves. Jackie shares with ChristianMusic.com. "I’ve been singing since I was 3 yrs. old. My Mom says I would stand in front of the mirror with a hair brush and sing and sing. At the age of 7 I directed one of the largest choir in LA. They would put me on a crate so that the adults in the choir could see me." First performances? "I use to sing on gospel radio stations at a young age. I guess I was around 10 yrs. old. I always sung in church. When my granddaddy would go to visiting churches to preach, I would be his special guest, to sing before he would minister." Another strong musical influence on young Jackie was voice teacher, Dr. Fordham. Jackie explains to ChristianMusic.com: "I always had a deep constralto voice. People would listen in amazement because I was such a little thing to have such a loud and deep voice. When I was a teenager I wanted to learn how to sing higher. I didn’t like my low voice. I went to Dr. Fordham, who was the voice teacher for the boy choir of England. He wouldn’t let me change my voice, He thought it was so beautiful and unique. He helped me to enhance the deep rich voice that I had." 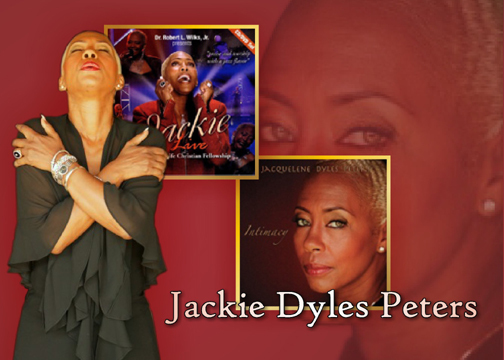 Jackie Dyles Peters' new album, JACKIE LIVE, showcases the Lord in a dynamic way, combining illuminating compositions and lyrics with powerful vocals, offering quite an inspiring, heart-felt collection of Gospel songs described as "praise and worship with a jazz flavor." The Holy Spirit flows through Jackie into her vocal performances, creating truly uplifting music, pointed at Jesus.